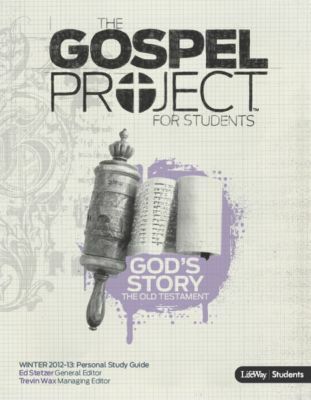 This week our church begins using The Gospel Project as curriculum for our Sunday School groups. My intent here is not to replace the material (as it is good enough), nor to write a commentary on it (as it is understandable), but to only add to the conversation in a way that may help our students and teachers hit the topics from other angles. My wife’s grandfather was a real craftsman with wood. He had a small shed in his backyard that served as his creative retreat. Inside his workshop were not only his countless number of tools but also piles of what looked to me to be scrap wood. What appeared to be scrap to me, in his hands, given time, would become nice pieces of furniture. Each piece reflected his vision and his skill. Each piece also bore his mark. Somewhere, hidden from view, he would sign his name and the year he made the piece. Several pieces he made now serve in our home as functional cabinets, tables, and stools. But they are more than this. They are treasures, especially to my wife and her immediate family, that bring back memories because they are reflections of her grandfather. They bear his name. They are the end result of his vision. They reflect his skill and care. The creation account in Genesis is not just about declaring who created the universe, but it is a rhythmic story of how. It does not tell us how in the same sense that a molecular biologist would explain to us how a cell comes to life. Instead, the creation account tells us how God created the world as an introduction to what God is like. He is powerful. With mere words He creates light, separates the waters, and brings forth biological life. While all of creation bears evidence of His design, none of it bears his name, but one piece. Man. Man, God created last. This was God’s crowning achievement. But he did not simply declare man. Everything else was spoken into being, but the Bible tells us that man was formed by God. Man began in God’s hands. Not only did God form man, but He breathed into Him. Our breath, our being, what we are is not simply a conglomeration of cells inhaling and exhaling oxygen. We are alive because we are fueled by the breathe of God. He did not blow on us. He brought us close to Himself and He breathed into us. It is then and only then that we became a living soul. Unique from all other creatures, He also gave us His name. We are created in His image. Compared to every other tale of creation, whether ancient or modern, the Creation story of the Bible stands alone. In other contexts we are either a grand biological accident or we are the refuse, the afterthought of the gods. The Enuma Elish of the ancient Mesopotamians made us the excrement of the dieties. To the ancient Egyptians, man was merely a slave of the gods. To the Greeks, woman was given to man as a trap. Pandora’s womb, or her “box” as we call it, would only bring forth evil each time it was opened. Darwin made us little more than monkeys. But the story the God of the Bible tells is that man was created purposefully, intimately, carefully, wonderfully. Genesis 1 and 2 tells us how we were made. In doing so this narrative brilliantly introduces us to the main character of the Bible’s grand story. When He created the world He was up to something good. In fact, once God created man, He called it very good. But it would not be long before it all went bad. Very bad. Posted in The Gospel Project.